In what may be an act of folly, I’ve decided to write a book. It will be a non-technical book for managers who work in the knowledge economy. The topic of the book is how humans think compared to how computers think. As Web 2.0 evolves into Web 3.0 (the “Semantic Web”), successful managers will need to know the difference between i-think and e-think. The primary problems I’ve encountered in writing this book include organizing my research and having the source information at my finger tips as I write. The source material includes scientific studies, newspaper articles, government reports, interviews, and so on. The number of discrete information items numbers in the thousands. In many respects, my problem is similar to any organization that wants to organize its “intellectual capital” into a readily accessible knowledge-base. 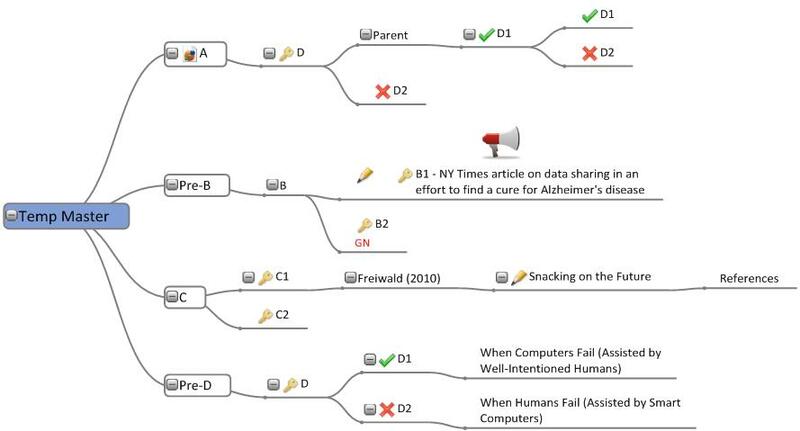 And ultimately, this is the challenge of the Semantic Web: creating knowledge representation schemes so that individual pieces of information can be organized into a conceptual framework that allows the end-user to access meaningful categories of information, not just scattered pieces of information. When viewed in this context, my little problem of organizing information for my book is a nano-microcosm of a far larger problem of organizing all of the information available globally through the Web. MindGenius (MG) has become a mission-critical solution to the problem of organizing my research – a true folly-buster. I have used other tools to gather information, such as EndNote, Evernote, and OneNote. But the search and retrieval across tools has proven impossible and I was losing track of what information was in which bucket. 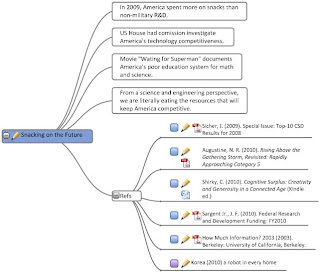 Because I had long been interested in mind-mapping software, I decided it was time to explore this option. I went online to look at the various products and quickly settled on the many cool features offered by MG. Having purchased MG a few months ago, I am more than pleased with the product and I keep finding new solutions for old problems. My first use of MG was to organize my book chapters and chapter sections. Because MG is so visual, it was easy to put my thoughts on the screen, move them around, and re-formulate ideas. Having discovered the joy of outlining, I began to explore more advanced MG features, such as: categories; category maps; project management; resource management; cost allocations; and indexing. I did this through a variety of “test” applications (see Image 1). For example, I would create four Level 1 branches (A, B, C, D), then added Level 2 branches (A1, A2, A3; B1, B2, B3; C1, C2, C3; etc. ), and then added additional levels. With this simple structure, I could play with building categories, assigning them to different items at different branch levels, and generate linked maps. I could then create category maps to see how the items grouped, and export these items to Word, Excel, PowerPoint, and Project Manager. Another important lesson I learned was that I could copy a branch and its sub-branches in one application and paste it (with all of its notes, categories and attachments) into another application. In other words, I could build new applications from earlier applications. Since the test structures were simple to construct, I could explore all of these advanced features in a few brief sessions of less than 15 minutes each. In other words, by playing with test applications, I quickly came up the learning curve for using MG to the max. Having developed fluency with MG, I returned to my book project and began transforming my book outline into a one-stop-shopping information repository. For each section within each chapter, I wrote the topic sentences as sub-branches. I also created sub-branches for each reference used in the section. I then attached the source document to the reference branch, or I could paste source text into the “notes” feature of the branch. The symbol of the pencil in the branch lets me know that I have populated the notes field (see image 2). By converting my simple outline into a comprehensive information repository, I made a giant leap forward in organizing the information for book writing. Now, I could write text and quickly attach reference material. And because MG is a visual product, I could easily move (or copy) text and reference material to some other section of the document as I edited the flow of the topics. While my MG application worked well as a project organizer and information repository, I decided that I needed to go one step further by creating a knowledge-base (KB) that would function as a higher-level information source not only for my book project at hand, but also for all future writing projects. 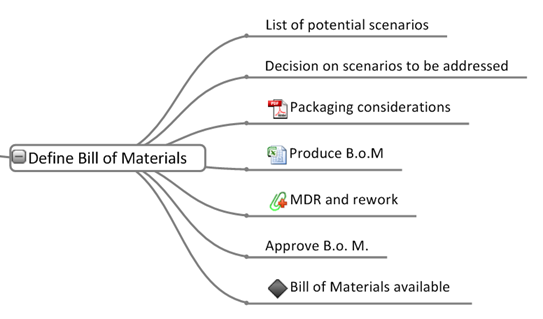 The difference between a project –specific information repository and a KB is that the organization of reference material for a project is specific to that project. Also, a particular information source might be used in more than one location, thereby creating a redundancy that is useful within the project, but less useful in “one-stop-shopping” for information. 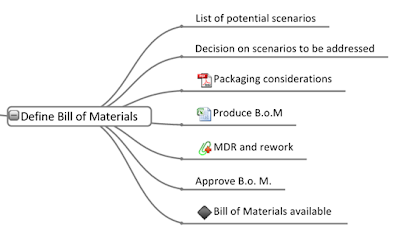 Plus, the logical structure of a MG project application is necessarily specific to the project. Because a KB has a more universal logic-structure, it can be used for many projects related to the KB domains. When properly constructed, a KB is a universal representation for some aspect of your world – personal or organizational. 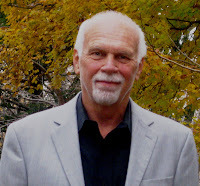 In technical terms, a KB becomes an “ontology,” a knowledge representation scheme that can be shared (or mutually constructed) with others who might be family members (family and household information), friends (book clubs, competitive sports leagues), or organizational managers (value chain, products, policies and procedures). The development of globally-useful ontologies is a core challenge for the creation of the Semantic Web. However, personal or organizational KBs are far smaller and scope and easier to build. I found MG to be an ideal environment to build a universal KB for my writing and consulting projects. The key to robust KB construction is creating levels of branches that identify domains and sub-domains. Specific points of information (documents, notes, Web-links, etc) can then be created in branches that are attached to a domain-chain. Here is one example of a domain-chain that goes from general to specific: Technology, Computers, Hardware, Smart Computers. In this example, I have added instances of source material to the “Smart Computer” branch (see Image 3). 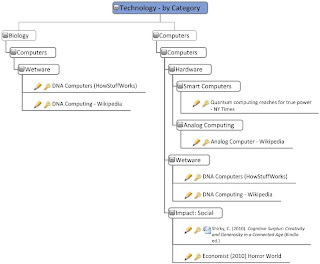 Besides the Technology domain, other high level domain branches in my KB include: Systems Theory, Network Theory, Information Management (see Image 4 showing the Info Management chain), to name a few. Besides the creation of domain branches, another important feature in constructing a KB is the use of “categories.” You can create your own selection of categories using the Analyze tab and selecting “Edit Categories.” There, I created “tags” that assign category attributes to the points of information. For example, in Image 3, I have two articles on DNA computers, to which I have assigned a “biology” category. 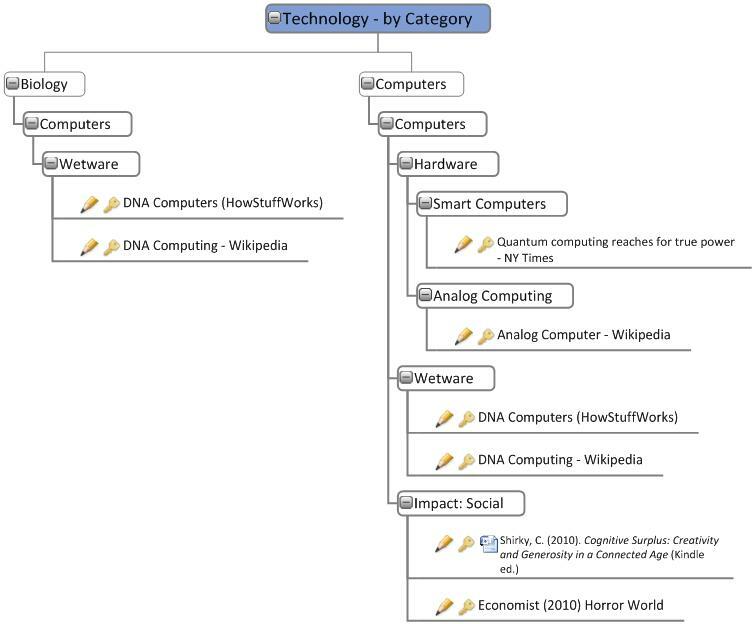 By creating a Category Map, I can find the articles on DNA computing under the Technology domain and the Biology domain (see Image 5). By using categories to assign attribute tags, my knowledge-base is a multi-dimensional representation of my research that can be searched using domain chains, category assignments, or key words. MindGenius has allowed me to organize my thoughts and research in a way that is intuitive, visual, and retrievable. Besides being useful, it has been fun to see my “mind product” taking shape on the screen. My KB application and my book application will grow together through a dynamic process of adding information and moving information as my own knowledge increases and as my book takes shape. You, too, can create applications like these by developing your own test playgrounds and by inserting your own creative juices – all with no programming skills. Enjoy! MindGenius Ltd are pleased to announce the forthcoming maintenance release of MindGenius 3. Version 3.7 will be available to download from our website on the 1st December and is free to all existing Version 3 users. As well as routine maintenance work, Version 3.7 includes integration with Windows Desktop Search, Map Preview Support and a Save as OPML option. Windows Desktop Search will now index the contents of MindGenius maps. This allows you to search for specific terms in your map from the Windows start menu or Windows explorer search bar. Branch titles, notes, resources, attachment names and descriptions, action details and categories are all indexed. New maps created and updated maps will index straight away. Existing maps may take a little longer to index as Windows does this in the background when your PC is idle. (a reboot can help get this moving). You can now preview maps in Windows Explorer (Vista, Windows 7) and Microsoft Outlook (2007, 2010) without opening them. The preview supports zooming and copy to clipboard functionality. We introduced the ability to import OPML files in Version 3.6, this allows maps created in certain iPhone/iPad applications to be opened directly with MindGenius. The Save as OPML capability added in Version 3.7 allows these maps to be edited in MindGenius and sent back to the iPhone/iPad applications. Look out for your reminder message on the 1st December which will contain details on how to update to 3.7. Whether attaching timesheets to project maps or web links to research documents utilising branch attachments can add great value to your project management activities. It is possible to attach any file type or URL to a branch and launch that file or web page directly from MindGenius. MindGenius can become a file library for your project! 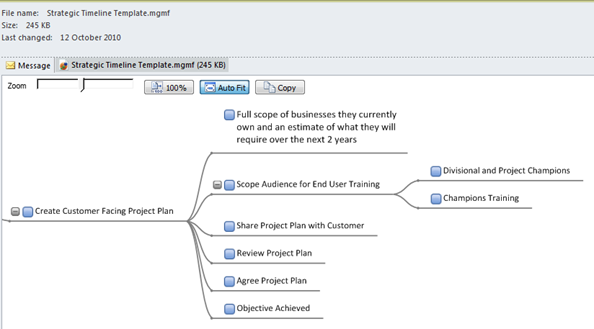 Attached files are visually indicated on the map, examples of an attached PDF file and an Excel spreadsheet are shown in the image above. An example of a branch with multiple attachments is also shown (Paperclip icon). Hovering the mouse over the symbol will display the list of attachments - click on one to launch it. Double-clicking on the attachment symbol will also launch the attachment(s). Make sure when sharing maps with attachments that every user has access to the locations of the linked files. If this is not possible then the MindGenius Distribute feature can be used to send the map and all attachments. The package can then be sent to colleagues who can open the package and extract the map and attachments allowing them all to be viewed. Attachments are also ideal for Research and allow you to build a map that contains links to all relevant files for a research project, or for an essay or report. Hamilton College is a co-educational Christian independent school for pupils aged 3 to 18. Currently the school community has around 650 children and young people in the Nursery, Junior and Senior Schools and around 100 teaching and support staff. Hamilton College has been using MindGenius for more than 3 years and it is available to all staff and pupils. Visual learners can quickly build up a bank of information independently and format mindmaps appropriate to individual preferences. Auditory learners can use the software as a note-taking tool, convert mindmaps into Word documents then use additional text to speech software to extend their understanding and learning. Kinaesthetic learners benefit as they are actively engaged in their learning. The whole process of “doing” is paramount. The example below is a map that was gathered in a class brainstorming on “Edinburgh.” The teacher used MindGenius on a whiteboard and passed around a wireless keyboard to the class and everyone added their own ideas. This allows learners to feel involved in class as they can see their ideas on screen. 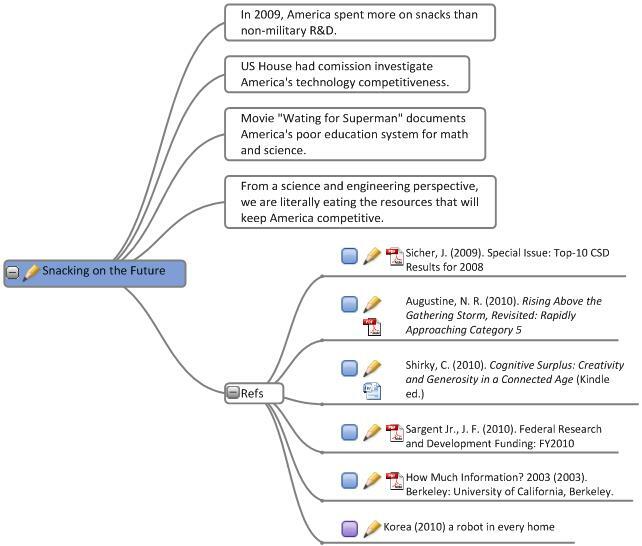 The added bonus is, of course, that there is a mindmap available to store for future recall either as a class handout or as a study guide. In addition to this, the mindmap can be exported into Word or Powerpoint, this feature of the software is very popular with both learners and teachers alike. In the example above, the teacher added graphics that correlated with some of the branches on the map, this made the map more memorable and more visually engaging for the learners, who can themselves easily add graphics and colour if they are working on a personal map. The ability to personalise the map helps promote creativity. 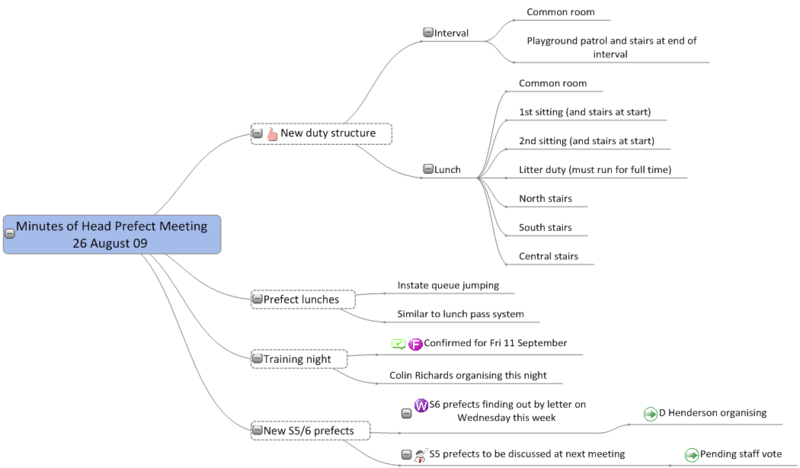 When ideas are first captured in class, it is often with a flat structure but as more ideas are added, common themes can become apparent and the teacher (or learners) can either drag and drop them into more appropriate locations, or categories can be assigned, like on the agenda below for a Prefect’s meeting. On the example below, categories have been added to visually signify the day of the week decisions have been made, progress on a task as well as the chosen decision for the new duty structure. At Hamilton College, there is a balance between whole class use of MindGenius and learners working independently. 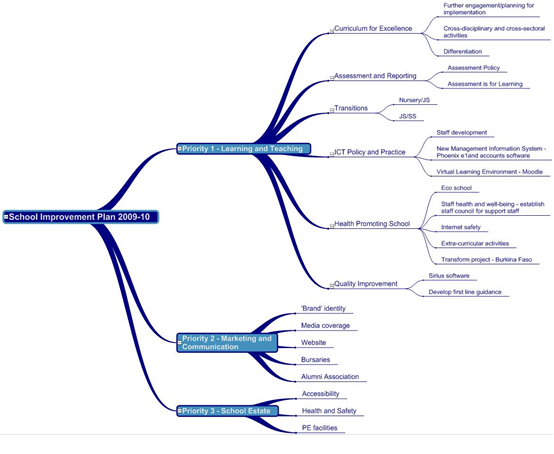 Pupils use MindGenius for developing mindmapping skills, extended writing planning, topic/project/oral talk planning, homework, revision, and meeting minutes. 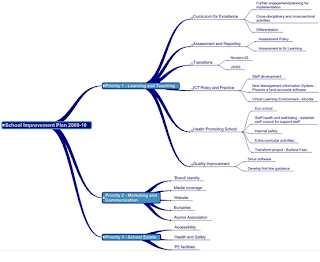 In addition, MindGenius is regularly used for strategic school planning, the School Improvement Plan (SIP) for example, has been presented to the Board of Governors, staff and parents and has been posted on the school’s website using MindGenius (see below). More generally, MindGenius is used in school by staff for lesson planning, meeting management, topic revision, planning/structuring PowerPoint presentations, giving feedback to pupils, collaborative working, and strategic planning. Introducing a new piece of software to a school can be a big decision to make, at Hamilton College the pupils were introduced to MindGenius through a rolling “awareness raising” programme involving pupils from J4 to S6, run by the Pupil Support (Learning) team in conjunction with class teachers in Junior School and Pupil Support (Guidance) team in Senior School. It’s not only the pupils at Hamilton College who use MindGenius, all teaching staff have had in-service training on using MindGenius and around 50-60% of staff regularly use the software. Finally, Lynn also believes that MindGenius has enabled increased access to learning in Hamilton College as many learners store their MindGenius mindmaps on the Hamilton College Visual Learning Environment (VLE) – Moodle. This is inclusive and can be used for a variety of purposes including revision, for other learners who would like to extend their knowledge and for others who have missed a lesson in class. Do you use MindGenius across your school? Is it similar to this use or how does it differ? 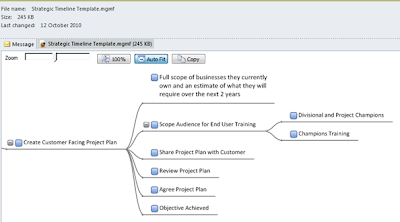 Interested in how mind mapping can help your Financial Services organization? Protinus are hosting a workshop in Glenview, Illinois Nov 16th which will cover the benefits of applying mind mapping in your organization, and using it with your clients, and attendees will leave with a plan to implement mind mapping in their organization. The one day workshop teaches the “Mind Map Illustrator™”process by which greater value is delivered to clients through clearer communication and enhanced capabilities. Attendees will be given a road map to assist them with implementing the plan to reinvent their firm and will receive hands on practical experience which will help them implement the Mind Map Illustrator™ process as soon as they return to the office. In one workshop, using mind maps as a review of a client case, Protinus discovered a major error on a client’s beneficiary designation that otherwise would have been missed. The workshop will run from 8:00AM -4:00 PM at 2700 Patriot Blvd, Suite 440, Glenview, Illinois 60026. To book, or to find out more information, either email kim.frank@protinuspro.com, or call (847) 730-1770. If you can’t make this workshop, Protinus have additional workshops scheduled for 2011 on Jan 27, Feb 23 and Mar 22. Wednesday 3rd November 2010 sees PILOT Share Fair 12 take place at the Aberdeen Exhibition and Conference Centre. PILOT Share Fair 12 allows attendees from the Oil and Gas industries to hear about latest developments in the industry, including hearing the 18 month forward plans of the major operators and contractors. This year delegates can pick up a free demo disk of MindGenius with their delegate pack. If you are attending PILOT Share Fair 12, look out for your MindGenius demo disk which also contains some examples of how those in the industry such as Technip, Baker Hughes, and Oceaneering are applying MindGenius and a special demo offer just for attendees.